With the spicy aroma of Cinnamon, Clove, Nutmeg and Ginger, and the Apple filling this Pie is definitely a treat for the palate! I adapted the recipe for Thermomix. tYou can find the original here: Double Cinnamon Apple Pie, by the great Sigrid from Cavoletto di Bruxelles. 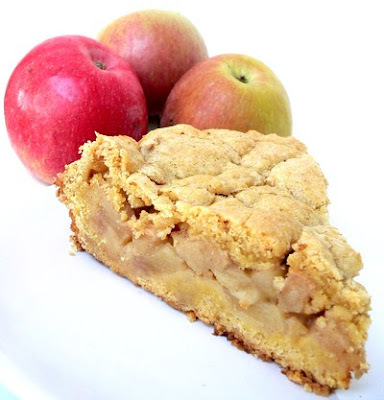 When my husband first saw this Apple Pie, he called it "stodgy-looking", but after he tried it he went totally crazy! Now he is really happy to find it on the table for breakfast before going to the office. So, very good Sigrid! and thanks to Thermomix that allowed me to prepare such a good cake in a few easy steps. Do you have a good recipe for apple pie you'd like to share? Send it to me! Or you can also send me the link to your blog! Put all the ingredients in the mixing bowl. 1 Min. Dough Mode. Wrap the dough in a towel and let it rest in the fridge for about an hour. Peel the apples, remove the core and chop them. Put the apples in the mixing bowl and spread with lemon juice, brown sugar and spices. 30 Sec. 30 Speed 1. Counter-clockwise. Let the mixture rest for about half an hour. Then, if you want, remove the cloves. I did, one by one, but you can also leave them. Divide the shortcrust pastry into 2 halves. Stretch out the first half in a cake tin (about 25 cm in diameter) with a raised border. Pour the spiced apple mixture onto the shortcrust base. Cover with stripes of shortcrust pastry, very close to each other. Bake 180 ° for 40 Min. Should be a nice golden colour when you take it out of the oven. You can serve this cake with warm custard, ice ream or whipped cream.